It’s almost mid-May and the Western States 100 countdown timer reads 49 days 16 hours. So, just 7 weeks to go until I am standing in the early morning at the Squaw Valley start line. This week, I have developed the feeling that time is running away faster than I’d like, but that is partly because the last two weeks training have not gone to plan. To recap, my last month of training has been divided up into a few different aspects: a short taper, racing the Hoka Highland Fling Ultra, recovery, and briskly back into the weeks of specific training for the Western States – during what is now the peak training period of my plan – including sessions back in the climatic training chamber at Napier University. 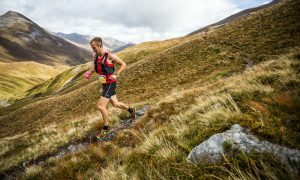 It was my third time running ‘the Fling’, which is a 53-mile trail ultra along the southern half of the West Highland Way, from Milngavie in Glasgow up to Tyndrum in Stirlingshire. 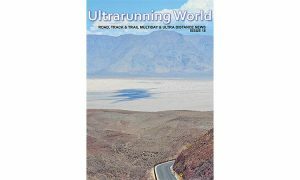 I reckoned this year it would be a particularly good training race, if such a thing exists, for the Western States – the route is hilly, mixed-terrain and an excellent test of fitness. Every year I have raced it I have found it challenging, punishing and uplifting in equal measure and this year was no different. I had a shaky start but paced myself better than in previous years and felt my hill/downhill training and higher mileage really slot into place, leading to a more comfortable race overall. I did however miscalculate one of the stiles midway through the race, missing the bottom step and landing hard with my left foot in an awkward position. 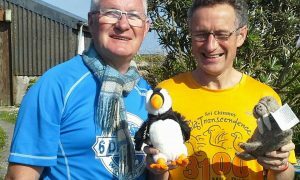 I felt a sharp shooting pain which I thought I could brush off, but after Beinglas Farm – the final checkpoint at 40 miles – I felt mild pain with every step. 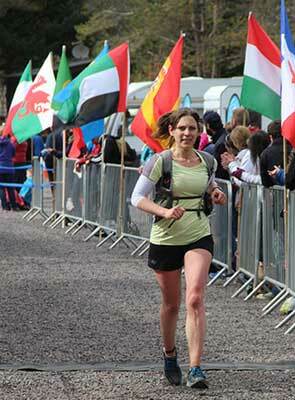 But I cracked on and was overjoyed to finish in 9 hrs 36 minutes, taking an hour off my PB for the Fling. On finishing, a dark bruise was spreading up my foot and I couldn’t put full weight on it, but thankfully my physio later reported he didn’t think I’d done major soft tissue damage and the bruising and inflammation was down to bursting a few blood vessels in the area. So the Fling was another good learning experience – as well as giving respect to the stiles, I also have to get a grip on my pre-race nerves. The start time of 6am is similar to the 5am start for the Western States, and I hardly slept at all the night before – not even an hour. I wondered if it was possible to run out of the adrenaline I’d need to get me through. As it happened, I didn’t feel tired after I settled into the race and it didn’t seem to affect my performance, as far as I was aware anyway. But I’d rather find a way to relax, switch off my mind and feel fully rested before the start of the big races, particularly the States. My full Highland Fling race report is here. I’d hoped to be running after a few days recovery but this was not to be. A week later I tried a few short, slow plods but had to take another few frustrating days break due to pain. But now, two weeks later, it is almost back to normal and I instinctively feel my body is healing well. I’m easing back into longer runs and hill sessions and will ease back off again if inflammation re-occurs – even another week off now, whilst far from ideal, would be preferable to the issue continuing or worsening to impact the States. 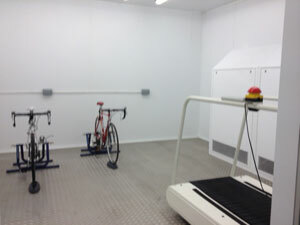 After the break, I ventured back to the warmer climes of the heat chamber to try an easy bike/run session. This time, we increased temperature to 33 degrees Celsius. I alternated from the stationary road bikes set up to the treadmill on a 20 minute rotation, along with two others sharing the chamber. This worked well, not least as my body is still adapting to being back on a bike after so long away from cycling! I cranked up the treadmill pace at the end of the session to 11km/hour and once again felt distinctly dizzy and sick when I left the chamber, another lesson that running at a pace you know you can maintain comfortably in the heat is so important – and it’s interesting being able to experiment with the tipping point in these sessions. As well as the logistical preparation that still needs attention, I have two longer 36 degree sessions left for June in the heat chamber, immediately before I fly on 19th June, to aid the physical adaptations. I will couple this with 4 more weeks of intensive training focusing on downhill, speed and back to backs, including a weekend running most of the West Highland Way in late May. Then in California, a week of light running and short hikes on the Western States route awaits, which I am looking forward to just about as much as the actual race. Having run in the Sierra Nevadas in 2011, I am so excited to be back in that beautiful, pine-scented environment again – hopefully with no stiles to negotiate. Until then, happy training and racing to all!